For the second year in a row, Mads has asked the candidates for VSA President a series of questions to help you better decide who to vote for. 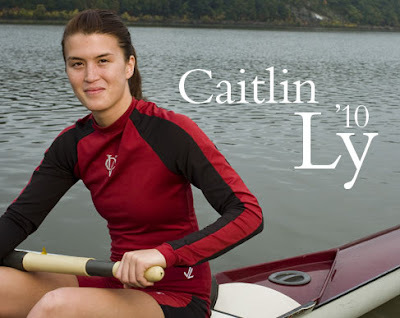 Here is our interview with Caitlin Ly '10. Be sure to check back for our interview with Nate Silver '10. Mads: What experience do you have that qualifies you for President? Caitlin Ly: I have served the student body for my entire three years here at Vassar, first as Vice President of the Class of 2010 and now as Vice President of Operations on the VSA Executive Board. I have also served on a number of committees (such as the 2010 Gift Committee where I helped raise over $6000 for the Sophomore Class Gift) and been a member of a several Varsity athletic teams, including Volleyball, Squash, and Rowing. In my current role as VSA VP for Operations, I oversee all the elected and appointed student members on committees, and I chair the Constitutional Review Committee, thereby gaining an intimate understanding of the College Governance, the VSA Constitution and Bylaws, and many other college policies. Beyond that, I have spent this year building relationships with senior administrators, faculty and trustees, which will make me a very effective President next year. I believe students need a President who will be a passionate advocate for their interests next year, and I am committed to using my experience and my knowledge to do exactly that. M: What campus issues matter most to you? CL: I have an ambitious set of goals for next year, but the three most pressing issues in my mind: 1) enhancing student input on teaching and tenure (rewording CEQ’s and repairing the broken advising system) 2) addressing the problems with the meal plan (lowering the walk in price and offering a-la-carte options in the DC as well as expanding late night options across campus), and 3) committing to sustainability and accessibility projects (supporting motion-sensor lighting in Rocky and a portable ramp in the dorms). Beyond these issues, I hope to expand on initiatives like Tasty Tuesday’s and Meet Me in Poughkeepsie to encourage a healthier relationship with the Poughkeepsie community and bring back Vassar pride on campus. I also want to work with the college to ensure that security functions primarily to keep the campus safe and secondarily to keep students safe at parties. Above all, I believe the VSA should encourage a spirit of community and collaboration amongst students, faculty and staff in this difficult financial period and work to put forward common sense proposals that are creative and pragmatic and will help save the college money while having the least amount of immediate impact on the Vassar community. M: What, if anything, do you want to see changed about the VSA? CL: The college committee structure needs to be overhauled and replaced with a system that works so that student voices are heard clearly in this time of financial crisis. As VP for Operations, I have been frustrated by the number of inactive and unproductive committees, with student delegates missing meetings and administrators failing to set agendas at the beginning of the year. I believe the college needs to hold committees to a higher standard by asking them to think critically about legislation and to make sensible policy recommendations. Committee chairs must work towards meeting the objectives set forth in their mission statements and to be in constant communication with other committees so as to avoid redundancies and to create efficiencies. Above all else, committees must function properly next year so that students, faculty and staff can vet the major issues facing the college and collaboratively put forth pragmatic recommendations in the best interests of the Vassar community during this economic crisis. M: If voters should know one thing about you or your platform, what should it be? CL: I will be a passionate advocate for student interests next year. I want to listen to your concerns and to act fairly and democratically on your behalf because I believe the VSA exists primarily to work for students. I want every student to feel like the VSA government is making a difference in your everyday life, and I will work tirelessly to ensure a transparent and open system where every student has a legitimate voice. A vote for me is a vote to make the VSA work for you. M: What is your favorite Vassar memory or moment? CL: There are a thousand…but one of my favorite days at Vassar was Outing Club’s “Lakefest” last year. I spent the day lounging in the sun with some of my friends on Sunset Hill, eating burgers and listening to the Walker Family Band, and then we topped off the day by kayaking on Sunset Lake. I love how chill Vassar students are and how such great days are really pretty common. M: Anything you want to add? Image via Vassar College Admissions.